In Suzhou’s enchanting Yangcheng Lake district an intriguing new village is taking shape, as one of the world’s most successful retailers puts the finishing touches to its first project in China. Value Retail’s 50,000 square meters shopping tourism destination is a triumph of imagination and craftsmanship, with an architectural theme that reads like a Hollywood movie script. Daniel Jeffreys reports. It was mid-morning on a sultry day in May 2013 when Brian Garrison suddenly furrowed his brow, the deep lines beneath his hairline echoing the long thin strands of structural steel that had been dug deep into a nearby field. Garrison’s gaze was fixed on a trench that had been dug in front of a mound of earth. The soil was muddy brown, streaked with rocks and pockmarked with construction debris, but a closer examination of Garrison’s face revealed that his mind’s eye was seeing a different picture, one in which the dirt had become a grand water pavilion and the rubble was an elegant water garden evocative of traditional Ming dynasty genre paintings. “The water flow will have to come from there,” said Garrison, the President of Value Retail International, his hands moving rapidly through the air to create an animated version of the architectural drawings he began crafting for Suzhou in early 2011. “I think we can make it move more elegantly if the twists and turns of the descent are wider.” That scene played out almost one year ago and since then Garrison’s vision for Yi Ou Lai Suzhou Village has blossomed. Where once there were dirt tracks there is now a network of smaller streets with stone mosaics branching off from the Silk and Jade Roads. The are two main thoroughfares that travel at an angle to each other until they meet in front of a tranquil stream. Between the banks an elegantly carved bridge curves sinuously over a freshly dug canal. Meanwhile, all that structural steel has become beautifully crafted European-style buildings that line the streets and will house high-end luxury and fashion brands, while the bridge takes visitors into a Zen-like water-garden that surrounds a hexagonal water pavilion attached to a charming Chinese style pagoda tower. These intricate details are the result of Value Retail’s determination that its first China destination will match or exceed the world-renowned quality of the nine villages it operates in Europe under the name Chic Outlet Shopping®. The pinnacle of the company’s European business is Bicester Village, a shopping destination outside of London that welcomes eighty per cent of Chinese tourists who visit the UK and which has the world’s best sales figures per square foot. In China, Value Retail will operate under the name Yi Ou Lai, which is a measure of its ambition for the Mainland China market. The character Yi means shining and implies “youthful radiance”, while “Ou Lai” means from Europe, with the character “Lai” also carrying the idea of “to come with”. In short Yi Ou Lai Suzhou Village will be a place where visitors can enjoy a radiant version of European style in the company of friends and family. The emphasis will be on youth and modernity and the experience will resemble a vacation at an exotic resort – where there just happens to be an array of world-class shopping. Garrison has been responsible for the design of Value Retail’s villages since 1994, when he worked on the creation of La Roca Village near Barcelona, a destination that opened in 1998 and was inspired by the historical Modernista movement. La Roca’s buildings are an interpretation of a traditional-turn-of-the-century Catalan town. His other works include Fidenza Village between Florence and Milan, an inspired interpretation of theatrical stage sets from a selection of Verdi’s operas. In common with other senior members of the Value Retail team in China, Garrison understands that Bicester Village has become a global benchmark for quality retailing and that Suzhou Village will have a lot to live up to when its doors open for business on May 15. “In a sense we are bringing Bicester Village to China,” says Mark Israel, the Chief Executive of Value Retail Management China. 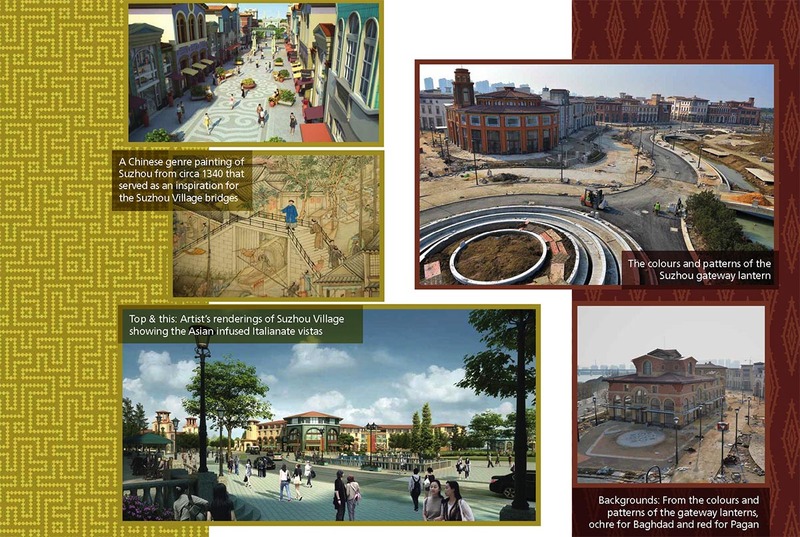 “But all of our villages have had a unique identity and Suzhou Village will follow that path. The essence of what we offer is previous seasons’ collections from globally esteemed brands, combined with a memorable experience. 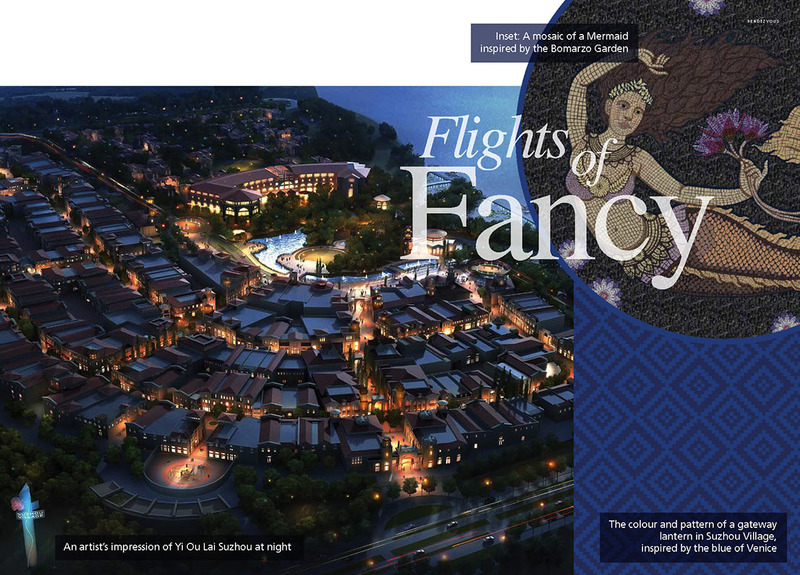 And each of our Villages executes that essence with their own special genius.” At Yi Ou Lai Suzhou the memories will come in the form of world-class gastronomy, art exhibitions, cultural events, exquisite entertainments and a level of service usually found in five star hotels. And then there will be the journey of the heart and mind that the village landscape provides – imagine Suzhou Village as a magic carpet that flies between two continents and across eight centuries while offering fantastic shopping and double caramel macchiato and you will get the idea. “Suzhou Village represents the virtues of travel and discovery and of craft and elegance,” says Garrison. The inspiration for Yi Ou Lai Suzhou Village came from Marco Polo’s travels in the 13th century, which took him from Venice to Constantinople, to Baghdad and Tabriz, across the snowy Pamir Mountains to Balkh, through the desolate Gobi desert and on to China, where he reached Suzhou in 1276. Garrison imagined that when Marco Polo left Suzhou several members of his expedition remained in 13th century Jiangsu province and built a settlement that was characteristic of Early Italian Renaissance maritime republics, with palazzo, canals, arched bridges, springs, piazza and loggia. says Garrison. “They were captivated by the natural beauty of the site, its mermaid and nearby silkworm farms and textile workshops.” The script for Yi Ou Lai Suzhou called for Value Retail to have rediscovered this centuries old village, restored it to its former glory and provided it with a new way to earn its living through shopping tourism. Once Garrison had created this concept he shared it with an illustrator who has been involved with other Value Retail projects. The illustrator began to sketch the buildings, piazzas and streets that evolved into architectural drawings, became wooden frames baking in the Suzhou summer, evolved into finished structures in the depths of winter and will open this Spring as a real living and breathing place where visitors can build dreams and fantasies of their own. “We have included the mermaid in the water garden so we have paid homage to the founding myth that is at the root of our ‘history’ and that will be the beating heart of the village,” says Garrison. “The garden and the mermaid are a place of inspiration where people can set their imagination on fire and go to the village with new ideas.” Yi Ou Lai Suzhou Village will also link to Marco Polo’s adventures in other ways. There will be four “lantern gates” that include the elevator shafts which will ascend from the parking garage and these will have décor linked to Venice, Baghdad, Pagan and Suzhou, which were all gateway cities that Marco Polo visited on his famous journey. For example, the Pagan gate will have a red tone, reminiscent of the Burmese city’s famous lacquer-ware and motifs derived from the geometrical shapes that made Pagan lacquer-ware a highly desirable commodity along the Silk Road. Once Suzhou Village has opened for business the streets are expected to come alive with curious shoppers, drawn by the beauty of the site and the opportunity to enjoy great bargains on stylish clothing and accessories. Those who visit will find that the Village’s architecture and decorative features are just one aspect of the story telling that Value Retail provides. From May 20th onwards Yi Ou Lai Suzhou Village will come alive with performances curated by Davide Quadrio, the Director and co-founder of Shanghai-based ArtHubAsia and one of the most influential figures on the Shanghai art scene. Quadrio plans to harness an international platoon of talents to deliver the story lines that are implicit in Value Retail’s architectural script for Suzhou, including its Marco Polo-based founding myth. Using flash mobs, interactive digital screens and internationally renowned performers Quadrio’s team will bring to life Marco Polo’s journey to Suzhou and the importance it had for European and Chinese culture. “Marco Polo’s journeys transformed Venetian culture, shaping art, architecture, textiles, cuisine and literature,” says Garrison. The performances will take place on a daily basis in phases that represent the full set of Marco Polo’s gateway cities, beginning with Suzhou in May and ending with Venice in October when Value Retail will present a grand celebration of Ou Lai, its rich European roots. The May event will be an embrace of Suzhou and Chinese culture with Quadrio’s entertainments being supplemented by an exhibition of emerging Chinese fashion designers in the Water Pavilion that celebrates the relationship between fashion and art. In the autumn the performances will tilt toward Europe. “The October event will have elements of the Venice Biennale (contemporary art), drama (the Carnevale and theatrical masks), Murano glass (craftsmanship) and opera,” says Garrison. 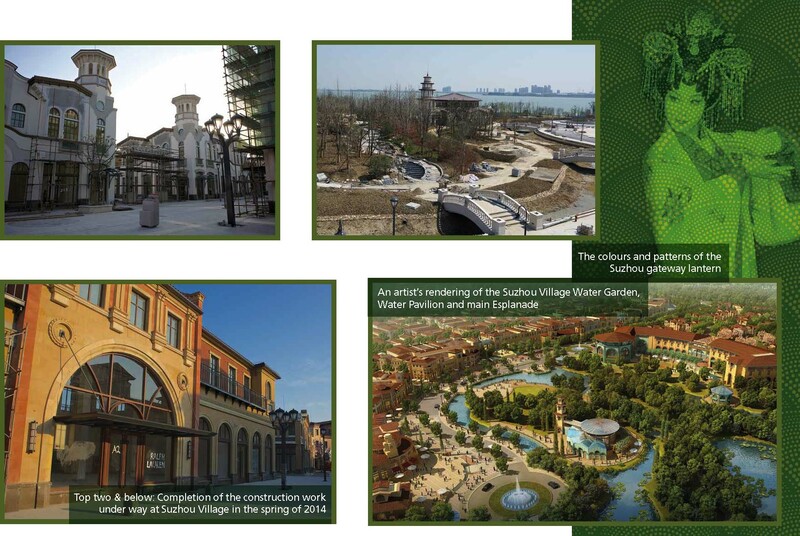 “This will mark the full arrival of Yi Ou Lai in China and the beginning of the next phase of our journey, which is the opening of Yi Ou Lai Shanghai Village in 2015.” The Shanghai Village with have an Art Deco theme, emphasising the rich variety of experiences that Value Retail offer to their guests. With such a deep investment in the stories that their shopping destinations tell, it’s no wonder that many see Value Retail as the founder of the shopping tourism concept. The company certainly represents shopping tourism’s brightest guiding light and the passion that Garrison and other members of the team bring to their work suggests that a visit to an Yi Ou Lai Village will never be anything less than memorable.